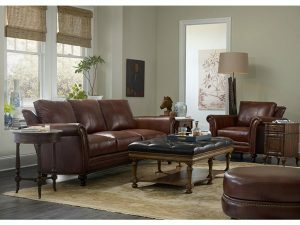 Creating Spaces for Gathering and Entertaining | Miller Bros. Furniture Store | Siouxland's Best Furniture at Great Prices featuring living room, dining room, bedroom, outdoor furniture and more! The home can be our personal refuge, but it can also be a gathering place where friends and family come together. The furniture pieces you choose for your gathering spaces can make a big difference when it comes to welcoming guests and encouraging a comfortable atmosphere. To inspire you in creating your own ideal gathering space, we’ve brought together a few of our favorite examples of cozy and conversation-inspiring pieces for your home. 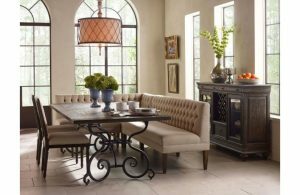 The Gentlemen and Ladies Quarters collection from Bradington Young is the perfect blend of old-world sophistication and modern sensibility and luxury, creating a warm and inviting haven for conversation at any time of day. From the rich mahogany details of the Richardson sofa and chair to the tufted leather cocktail table, these pieces are ideal for those after-dinner conversations that stretch late into the evening. The kitchen is one of the most natural gathering places in the home. The sensory experience of preparing and cooking food and the bustle of work and conversation converge here. 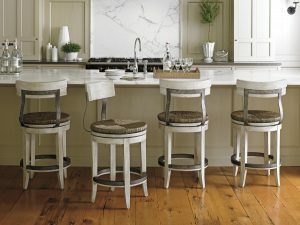 Elegant and functional seating like these swiveling Merrick counter stools from Lexington encourage movement and activity while keeping the conversation flowing. With this upholstered dining bench from Kincaid’s Banquette Dining collection, the conversation around the table never has to end. The comfort of the upholstery and the unique feeling of bench seating gives a sense of friendliness and dining out, right at home. There’s nothing like a warm, crackling fire to bring friends together and inspire moments that stay with us for years. 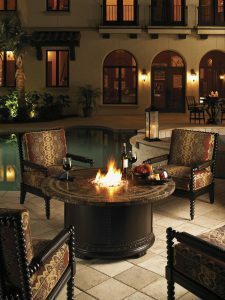 When the stars come out and the night air is crisp and cool, this Kingstown Sedona fire pit table will cast a glow on your company late into the evening as they gather around the table. What’s your idea of the perfect gathering space? Whether you’re looking to create a space where family can spend quality time together or an inviting gathering place for friends, you can find these and other beautiful pieces at Miller Bros Furniture! Visit us online to browse for more inviting ideas, then stop in to bring your dream entertaining space to life with the help of your very own design consultant.